If you’re in the market for a used Toyota car near Avon, Indianapolis, and Plainfield, you may have heard the term “certified pre-owned” thrown around once or twice. 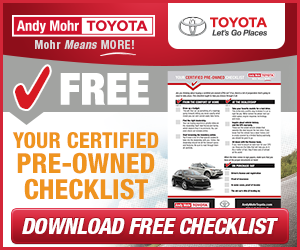 So, what is a certified pre-owned Toyota, and how can it benefit you? In this article, the Andy Mohr Toyota team is going to help you understand what sets these models apart. When your typical used car arrives in a dealership’s hands, it goes through an inspection and maybe even a little makeover. Then, it’s ready for the lot. Certified pre-owned, or CPO, Toyotas, on the other hand, receive a little bit of extra attention. A Toyota CPO model undergoes a more rigorous inspection, is refurbished (as needed), and will then earn extended warranty protection. In the end, these cars come out as close to new as possible. To ensure top-notch quality in all Toyota CPO cars, each vehicle is subjected to an intensive 160-point Quality Assurance Inspection. During this inspection, the car must meet strict mechanical, cosmetic, and detailing standards. If something doesn’t quite match up, the technicians will outfit the car with genuine parts and repairs. Toyota stands behind every automobile they create, and that confidence also extends to their CPO models. Each of these cars comes with two separate warranties. From the date of your purchase, your car is protected by a 12-month/12,000-mile Limited Comprehensive Warranty, which covers the replacement or repair of any component that fails due to a defect from normal use. There is also a 7-year/100,000-mile Limited Powertrain Warranty that covers select transmission and engine parts as well as internally lubricated components. With every Toyota CPO car, there’s also one year of roadside assistance. This benefit covers a majority of services, such as jump-starts, flat tires, lockout service, and towing or fuel delivery. You’re also reimbursed for the towing to your closest Toyota dealership. If you’re in need, you can call toll-free for service 24/7. Now that you know all the benefits of buying a Toyota CPO vehicle, you might be interested in learning more about our special incentives. For select models, we offer special incentives, including low lease pricing and other helpful deals. These can really sweeten the pot, whether you’re buying new or certified pre-owned. Check out our current Toyota CPO incentives online today! When it comes time for Avon, Indianapolis, and Plainfield drivers to start searching for their next car, we make it easy. Our entire selection of CPO Toyotas is available online for your perusal. Start browsing the Andy Mohr Toyota inventory online today to find your next car!